Seven Beland: Happy New Year, 2012 ! Happy New Year, 2012 ! 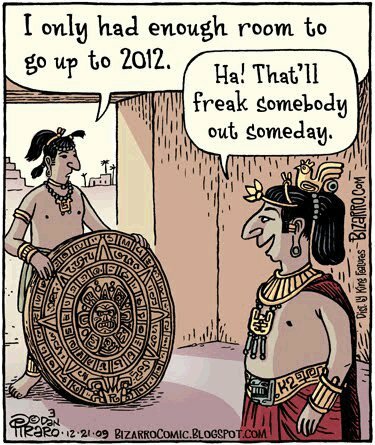 This ... is my all-time favorite illustration about 2012. By now everybody has heard about the Mayan calendar that will end -converted to Gregorian calendar- on December 21st, 2012. Certain circles already started to panic years ago (some time around 1999?) that the world is going to end. Books have been written, movies were made and believers are getting ready for the big event. Well ... the Mayans didn't say that the planet is going to be sucked into a black hole or explode or hit by a comet or burned down by aliens. They simply wrote that the world as we know it is going to end. And that's evident around us already now. Old structures are breaking up, the old is trying to resist the new, and the tensions will get stronger - for a while. But 2012 is also the year of change. I would like to encourage each and everybody to welcome the opportunities that present themselves before us. Chaos offers change and change becomes chance. 2012 will be a most interesting year. Take the chance and enjoy life to the fullest. Happy 2012!